E-learning can replace or enhance instructor-led training in almost every situation. Plus, doing so will bring substantial benefits to your business. 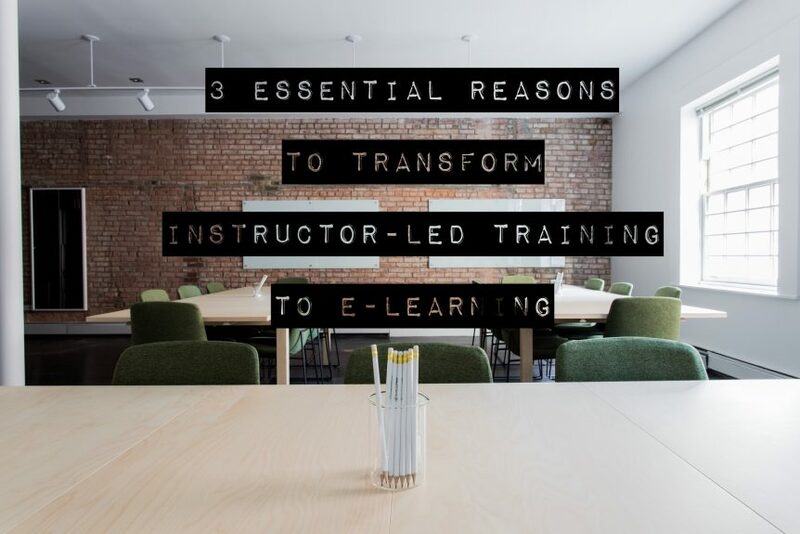 To demonstrate this, here are three essential reasons to transform instructor-led training to e-learning. Cost is one of the big differences between instructor-led training and e-learning. Specifically, e-learning is less costly, particularly when measured over time. In companies that have disparate workforces, these cost savings can be even more substantial. After all, e-learning does not involve people going to a central location in Dubai or elsewhere, so doesn’t incur the same travel, accommodation, or lost productivity costs as instructor-led training does. However, cost is not the only factor you should consider when looking at converting your instructor-led training courses to an e-learning format. In fact, a more important measurement than cost is return on investment. All these savings add up to deliver a better return on investment than instructor-led training. In addition to your business getting a better return on investment, learners benefit from e-learning too. Firstly, every member of your team receives a consistent learning experience when you use e-learning. With instructor-led training, learners can have very different experiences depending on the instructor they get. Even the mood and energy levels of an instructor on a given day can impact the experience of learners. Flexible – with e-learning, your employees can go through a training course at a time that is most suitable to them. Plus, if you make the e-learning course accessible on mobile devices, they can train wherever they are. Content is more relevant – you can customise e-learning courses for small groups or for individual learners. Doing something similar with an instructor-led course is very difficult as the instructor must deal with multiple people at once. Crucially, making the content of your course more relevant by customising elements will deliver better results. Empowers the learner – e-learning also empowers the learner as it places them in control of various elements of their training and development. Examples include letting the learner decide when to complete the training rather than allocating them a date and time to attend an instructor-led course. More engaging – you can use tools in your e-learning courses like gamification and scenarios. These tools make your courses more fun and engaging, increasing levels of participation as well as making learners more enthusiastic about training. Instructor-led training, however, is often viewed by learners as being a chore and/or a distraction. Higher retention rates – all the elements above result in e-learning delivering higher retention rates compared to instructor-led training. Plus, it is easier to incorporate learning techniques and strategies in an e-learning course than it is in an instructor-led course. Examples include spaced repetition, just-in-time learning, and microlearning. All of these strategies can improve retention rates even further. Data on individual learners – you will know which employees complete specific e-learning courses plus you can include quizzes and tests within the course which will give you feedback on how well they know the topic after completing the course. Data you can use to improve future courses – you can also use the data you get from an e-learning course to make improvements to that specific course as well as to other courses you create. This could be data from direct feedback, i.e. asking the learner what they thought of the course. It can also be analytical data. For example, high numbers of people getting a question wrong on an e-learning course quiz could indicate you need to improve the course content. Crucially, the data you get from e-learning is real-time and objective. This is different from instructor-led training which produces subjective data, i.e. data that is dependent on the opinion of the instructor. It can also take time to gather data from instructor-led training. E-learning generally cannot fully and automatically replace all instructor-led training in your business. There will be substantial elements of your instructor-led training programme, however, that will be better suited to e-learning. Starting the process of converting this training to e-learning will enhance your business, improve the skill levels of your employees, and better equip your business for the challenges and opportunities of the future.